In the future, biotechnology could serve up some interesting dishes—of the lab-grown variety. The world has already been introduced to lab produced beef and chicken, now a San Francisco based startup called Memphis Meats, which recently made its debut, is planning to grow pork (as well as beef) in laboratory bioreactors. They could very well be the first company to bring lab-grown meat to the market. According to the company, they plan to sell animal-free products to high-end customers in the next three to five years. They are also responsible for creating the world’s first lab-grown meatball. Lab-grown meat could very well be the future of food, but it continues to draw polarizing views from the public. While some say that it could completely replace animal agriculture, others insist that it’s nothing more than a fad, that it will be little more than a passing novelty. 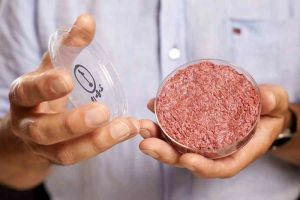 Largely however, most speak of the feasibility of lab-grown meat, which can be produced at a significantly lower per capita cost versus growing it in the traditional way. That said, currently, the technology to grow meat in vitro is still in its infancy, and the cost it took to create the stem cell burger first created in 2013 cost $330,000. However, it seems that production costs continue to fall annually, which makes use of the methods more promising. Despite that, major challenges remain. The method that Memphis Meats uses for growing animal muscle tissue in bioreactors seeded with stem cells and nutrients means they have to ensure that the tissue must remain oxygenated. This means they must grow cells in very, very thing layers. Additionally, lab grown meat relies on a nutrient rich cocktail extracted from unborn calves called fetal bovine serum—this is not only expensive, it’s also counter-intuitive to the whole premise of lab-grown meat, which hopes to remove animals from the equation. Still, in the coming months and years, new progress may be see which circumvents the aforementioned problems.